INTV Night Stalker in 03:09.62 by TheWinslinator & SuperMonkeypotato. Night Stalker is a top-down maze shooter released in 1982 for the Mattel Intellivision. You are trapped in a maze while robots, spiders, and bats relentlessly track you down. The key to survival is to destroy as many of them as possible -- before they get you! 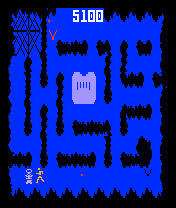 While the robots only spawn in the lower left corner of the map, the player is normally given an incentive to wander throughout the maze when ammo spawns in a far away location. TheWinslinator and SuperMonkeypotato make the game look too easy by manipulating ammo to also only spawn in the lower left corner for the fastest robot massacre in history! The robots aren't shown any mercy once an Invisible Robot is killed, which appears after 80,000 points is reached, and marks all of the game's content being showcased.